you are, how you eat tells all. constantly or try not to think about it at all — you can be free. Just look down at your plate. The answers are there. we contact the part of ourselves that is fresh and alive. We touch the life we truly want and evoke divinity itself. 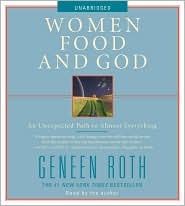 The author of this book, Geneen Roth, was on Oprah a few weeks ago. Sometimes I watch. Sometimes I don't. Several nights ago, at 12:20 am, I watched. It was extremely interesting to hear her perspective about why we all eat. Emotionally trying to fill something. I can be found eating pretzels like it's my job. But, everything, in my opinion, stems from our childhood and how we have evolved into the person we are today. Each of us having our our own unique personality. No two people are alike in how we react to life's triggers. We are uniquely effected by the things happening around us. my main goal in life: to live a long happy life with no regrets. Because I do not want to spend my life worrying about food. I want to enjoy my life to the fullest. Not worry day to day about how I should not eating certain foods. But simply make more conscious choices towards living as healthy and happy as possible. I will continue to live each day putting my family first, and living a healthy lifestyle. thinking I was not good enough, skinny enough or ANYTHING enough. You look like a MODEL compared to how you look now at 80. All the little things that you may stress out about now mean NOTHING. money to have that new pair of shoes, a new outfit or a new car. More time not spent with your parents and the chance to learn something new. More talks with your husband because he has a way of making you feel special. And not having more hugs from your three little girls who look up to you more than you'll ever know. You can never get this time back so live life to the fullest each and everyday!" gave me and continue to keep it healthy for a long happy life. Appreciating myself for being me. And food should not be what I turn to when I'm bored or feel stressed. But something that fuels my life toward peace, happiness and love. My parents and my three sisters. If you have, I'd love to hear your thoughts about it. What a lovely and inspiring post. I hope reading Women Food and God will reach you in places that you never imagined and that it will help you on your journey. Yea!! Someone else doing a book review! wow! Impressive! You got a comment from Geneen! I just started reading this book after seeing her on Oprah. As I watched I felt like she was talking directly to me. I have been reading it and already feel a difference. I find myself questioning if I am truly hungry or not before eating. The most valuable lesson I have learned so far is to stop trying to fix myself. What if I was ok just as I am today? I literally been dieting since I was in the 5th grade when my parents first took me to weight watchers... I have lost and gained many times. After having gastric bypass surgery and losing 130lbs, only to gain half of it back... I am hoping to get to a point where I eat to nourish my body, not to nourish my soul. My hopes are that this book will help me learn how to do that. To be free from diets. To be free from my obsession over food. Thank you for sharing. I look forward to further discussion regarding this life changing book. What a darling post. Your header makes me think of my sisters... I'm the oldest of three girls. Beautiful girls you have. Love your blog and I'll be back to visit. Good one, Marta! I will def be looking into this!